Doug Whatley, CEO of BreakAway Games, said the government is showing a lot of interest in "serious games" used for training. "It used to be you couldn't say the word 'games' and be taken seriously," said ThoughtLink's Julia Loughran. "Now games are where it's at." 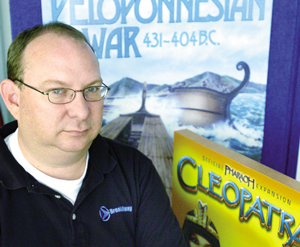 It's an unusual situation for a game developer, but Doug Whatley isn't complaining. The chief executive officer of BreakAway Games Ltd. In Hunt Valley, Md., said only a quarter of his company's business comes from its entertainment titles, such as "Waterloo: Napoleon's Last Battle," and "Emperor: Rise of the Middle Kingdom." The rest comes from Uncle Sam. "We try to keep a 50-50 balance between entertainment and so-called serious games for the government, but there's just a lot of government interest right now," Whatley said of his 70-person, $8 million company. So much interest, in fact, that game developers will congregate in Washington Oct. 18 and 19 for the second Serious Games Summit, a conference designed to bring together government officials, systems integrators and gamers to identify ways that games can help agencies function. The first summit, held in San Jose, Calif., in March, attracted 300 attendees. Organizers expect 500 at October's meeting. Since 1997, when the Marine Corps used id Software Inc.'s popular "Doom" game as the basis for a training tool, agencies have experimented with computer games for purposes ranging from e-learning to analysis. But over the last year and a half, game developers said, experimentation has evolved into a full-blown market opportunity. "The number of people in agencies and other companies that have become aware of the benefits of using game companies to do serious work was completely changed," Whatley said. "So the amount of work we're being offered has exploded." Ben Sawyer of Digitalmill Inc. in Portland, Maine, which co-produces the Serious Games Summit, said the market for games that do more than entertain could be upward of $20 million, but he said no one knows for sure. Sawyer, who also co-founded an initiative by the Woodrow Wilson International Center for Scholars in Washington to examine the use of serious games in the public sector, is studying the market size. Whatley said he's eyeballing the estimated $24 billion he expects the government to spend on training, and predicts games will start claiming more of that budget. Regardless of spending levels, experts said, forging relationships with game developers will help integrators stay on the leading edge of training and simulation technology as agencies look for new and better ways of conveying information. Consider the Defense Department's Training Transformation program. "They're looking for alternative methods for doing training and exercises, and they're looking at games," said Julia Loughran, president of ThoughtLink Inc., a Vienna, Va., consulting firm. If integrators "want to get involved, they should start thinking that way and steer away from massive, multimillion-dollar simulations." Indications are that game developers and integrators are getting better acquainted. Sawyer said gaming companies have gradually learned how to approach and work with the integrator community. For its part, BreakAway has worked with several companies, including Booz Allen Hamilton Inc., Lockheed Martin Corp. and Northrop Grumman Corp., Whatley said. "Quite a few integrators see us as a key member of the team when it comes to getting bigger contracts," he said. Agencies are turning to the game industry for two reasons: lower costs and improved quality of user experience. At the Defense Department, computer games cost significantly less than a large-scale simulator in which trainees sit in a cockpit, or another life-size system. For example, Lockheed Martin in July won a contract to build convoy simulators for $9.6 million. The biggest government-related game projects cost less than half that, Whatley said, and many projects, such as BreakAway's "Incident Commander" game developed for the Justice Department, cost well under $1 million. What's more, games can be deployed cost-effectively online or via CD-ROM. With simulators, the military must bear the cost of bringing trainees to the simulators. Games can be more effective than simulators or conventional desktop-based training programs, because users enjoy them more, experts said. "There is a feeling that standalone simulator training isn't a full or compelling experience for the trainee, and that the gaming industry has a format that is more compelling," said Henry Lowood, a technology historian at Stanford University. [IMGCAP(2)]Games by their nature are competitive, fast moving and entertaining. They also tend to include better and more realistic graphics and sound than simulators and e-learning games. And unlike today's training software, games are different every time they're played, while other programs tend toward linear story lines and repetition. "The key for DOD, Homeland Security and others is that they want to increase the frequency that people train, increase the number of people who actually do the training, and lower cost," Loughran said. In 2000, ThoughtLink developed a simple online game, called "ScudHunt," for the Defense Advanced Research Projects Agency's Wargaming the Asymmetric Environment program. "ScudHunt" is a command and control game that Loughran compares to the popular offline game "Battleship." It's played in teams, and requires players to share information in order to win. More recently, ThoughtLink has begun working with the Homeland Security Department's Office for Domestic Preparedness to study how games can be used to train first responders on how to react in an emergency. "Studies have shown that if you're having fun, you're learning better," Loughran said. No one expects games to supplant simulators or training software in government agencies. Stanford's Lowood said simulators would still be critical tools for teaching how to do things, such as fly the latest fighter planes. But games can teach decision support skills and train people to respond in different situations. And they're not just for government workers anymore. "America's Army," an online recruiting game developed at the Defense Department, has nearly 4 million registered users worldwide. It's meant to put players in the role of a soldier and teach them teamwork and responsibility through real-world deployments. "Full Spectrum Command," a Defense Department game developed by the Institute for Creative Technologies at the University of Southern California, has been ported to Microsoft's Xbox game platform under the name "Full Spectrum Warrior." Both titles are often-cited examples of successful government gaming programs, and experts said they represent the beginning of this trend. Whatley said the Justice Department is interested in using games to teach law enforcement skills, and from the National Institutes of Health to improve training in the medical community. "It used to be you couldn't say the word 'games' and be taken seriously," said Loughran. "Now games are where it's at."